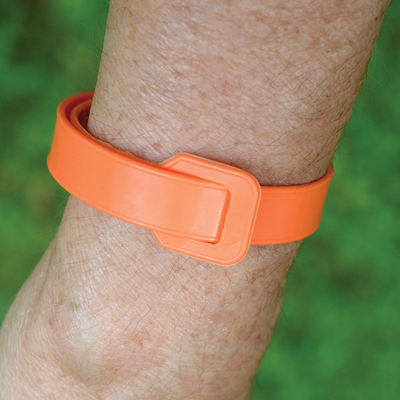 The vapors from the BugBand® Insect Repelling Band form a protective shield around the immediate area, keeping mosquitoes, black flies and gnats a safe distance away. BugBand® is waterproof and keeps on working, even while swimming. Packaged in a reusable plastic "pod" in which to store between uses. Reusable up to 120 hours. Made with Geraniol and natural oils. DEET-Free. Safe for the entire family. Adjustable, one size fits most.